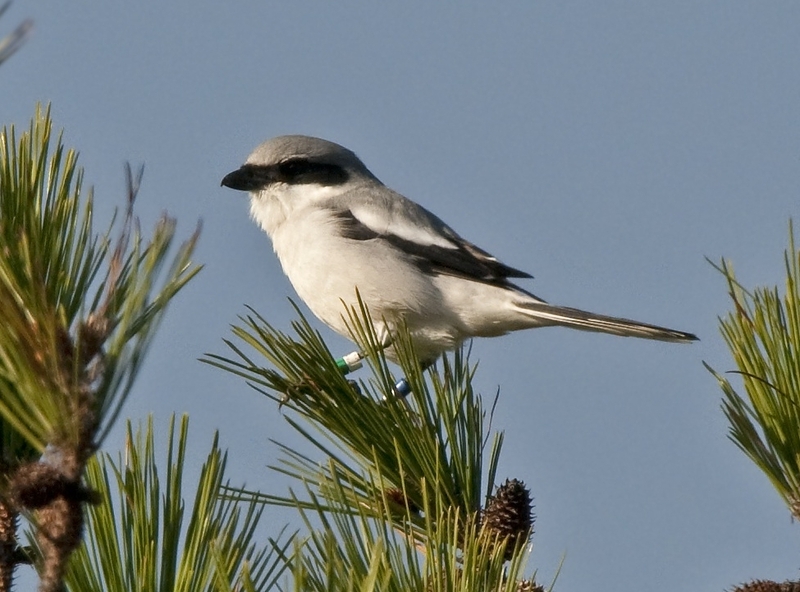 If you spot a Loggerhead Shrike, check to see whether it has bands on its legs. These bands may look like a flash of color or bump on the shrike’s legs. If you think you see something, try to get closer and check for bands – but be careful not to get too close to a nest during the breeding season! Shrikes usually have a few favored perch sites, so keep an eye on these. With patience and a good scope or pair of binoculars, you have a good chance of reading the band combinations. Researchers working with the Loggerhead Shrike have agreed upon a common banding protocol that uses double-overlap plastic bands in the following colors: White, Yellow, Orange, Red, Gray, Light Green, Light Blue, Dark Green and Dark Blue. Each region has been assigned a color to be placed on the same leg as the Silver (steel) band. If you spot a shrike, it may be hard to see the color of the band that is used with the Silver metal band. However, if you can determine this color, it will tell us the region and year in which the bird was banded. Bands are read upper left over lower left, followed by upper right over lower right. Remember that left and right refer to the bird’s legs, not your own perspective! Only the federally issued "silver" (stainless steel) band has a number. This can only be read by holding the bird. Only people with training should handle live birds. If you find a dead shrike with a metal band, be sure to report it to the Bird Banding Office in Canada or the Bird Banding Lab in the USA, but don’t handle the bird without using gloves or a plastic bag to protect your hands. If you spot a shrike, be sure to contact us. We actively monitor shrike movement and patterns. Your observations are vital to our research. Welcome to the Shrike Force!